When micro cars first came out the joke went: you need two – one for each foot. The roller-skate analogy could equally be applied to the new Hyundai Kona but for one thing. In the latest technology, comfort and convenience, the small SUV is kitted out almost as well as big brothers Tucson and Santa Fe. Like its bigger siblings the Kona comes in four levels of specification – Active, Active with Safety Pack, Elite and Highlander. With the choice of two petrol drivetrains, a 2.0-litre, naturally-aspirated unit mated with six-speed automatic transmission and front-wheel-drive, or a 1.6-litre turbo-petrol unit matched to a seven-speed dual-clutch transmission and all-wheel-drive. Prices start at $24,500, plus on-road costs, for the Active 2.0 six-speed automatic 2WD and top out at $36,000 for the Highlander 1.6 turbo AWD with seven-speed double-clutch automatic. 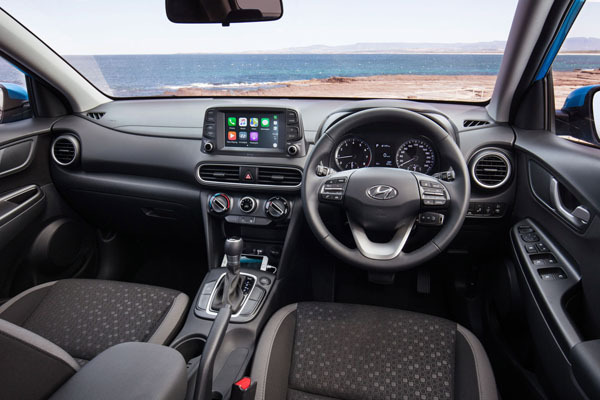 The front of the Kona is striking, with daytime running lights being separated from the main headlamp assembly, with Hyundai’s new hallmark cascading grille, finished in black for the Active model with black mesh inside a black surround. Elite and Highlander grades feature a carbon grey mesh grille with chrome surround. The headlights (LED on Highlander) are mounted below the LED DRLs, which also have turn indicators at their outer extremities. Fog lights are set low in the front spoiler, inboard of the headlights. The design theme of the front is reflected at the rear where a second pair of combination lights is mounted higher in the tailgate, just below the rear windscreen. Optional contrasting roof colours are available, while alloy wheels are standard with a different size and pattern for each model. Active has 16-inch wheels with a classic five-spoke design featuring twin spokes; Elite’s 17-inch wheels have a 20-spoke design while Highlander’s 18-inch wheels feature the classic five-spoke look with twin offset spokes in a contrasting black and machined metal finish. Inside, a large tablet-style multimedia display of the latest infotainment functions, is fitted across the range, mounted high on the centre of the dashboard. Contrasting colour trims of red or yellow can be optioned and can be enhanced with piano black finish on the door handles, air vents, transmission housing trim surrounds and steering wheel. Kona will seat five with ample leg room front and back for the average size person. Luggage space is 361 litres with the back seat in place, expanding to an impressive 1143 litres with the rear seat back folded. A rigid boot floor can be used at two heights allowing oversized cargo such as a bike or golf bag and cart can be carried. Upmarket features includes a head-up display in Highlander projecting a virtual image of drive-related information – speed, audio, cruise control details and systems warnings – onto a clear panel mounted behind the instrument binnacle. Also featured in Kona is wireless phone charging via a pad in the centre console for Qi-enabled phones. LED headlights have a ‘bending’ facility that produces extra lighting at the sides of the vehicle based on the steering wheel’s direction of turn, giving extra illumination on the insides of corners. 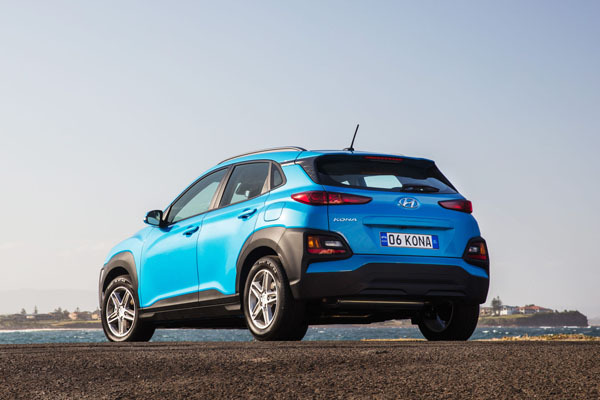 Hyundai Auto Link connects Kona’s to a smartphone via Bluetooth, keeping track of the vehicle’s performance and providing analytical information such as vehicle diagnostics, including tyre pressure monitoring and vehicle ‘health-check’ status, driving history statistics, parking management, easy service scheduling and automatic access to roadside assistance if required. Infotainment is in the hands of Apple CarPlay or Android Auto. Safety times include forward collision assist, blind spot warning, lane keeping assist, driver inattention warning, high beam assist and rear cross traffic alert for use when reversing out of a parking spot. Electronic stability control and vehicle stability management take care of active safety, while emergency stop signal and rear view camera and park assist play their part in protecting the vehicle. The 2.0-litre has power and torque of 110 kW at 6200 rpm and 180 Nm at 4500 revs, respectively. Hyundai’s 1.6-litre ‘Gamma’ four-cylinder engine has a power output is 130 kW at 5500 rpm and torque of 265 Nm from 1500 to 4500 rpm. Drive Mode Select is available on both torque convertor and DCT variants, letting drivers choose between ‘Comfort’, ‘Eco’ and ‘Sport’ modes. During a launch drive out of Canberra and through the Yass Valley the 2.0-litre took some urging off the mark and when pressed did so to the accompaniment of a harsh note. At city speeds the powertrain was unruffled, producing an adequate ride and handling experience. The 1.6 turbo, on the other hand, was sweet as, slipping between cogs smoothly, resulting in a responsive and spirited drive. Steering was just as positive and it goes without saying that all-wheel drive made for a sure footed stride on gravel. Kona has benefitted from input by Australian suspension engineers, hence the assuredness of both front-wheel and all-wheel drive models. “We tuned the chassis to make it more compliant and controlled for Australian country roads but also make it really responsive and great fun through the corners,” explained General Manager of Product Engineering Hee Loong Wong. 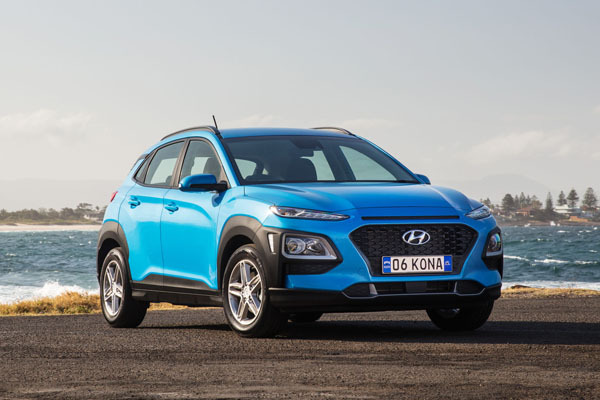 Hyundai admits it’s coming to the small SUV segment late, leaving the market to the likes of the Honda HR-V, Mazda CX-3, Mitsubishi ASX, Subaru XV and Toyota C-HR to fight it out for sales. However, local executives maintain that the extra time and effort put into the Kona have enabled the company to produce a vehicle with superior performance and packaging. Over to you, punters.